This year Kleenheat’s again excited to get behind the Good Food & Wine Show Perth, returning to the Perth Exhibition & Convention Centre for three mouth-watering days from 14 – July 2017. Enjoy a fun day out with friends discovering new foods, new wines and latest products from hundreds of local and international exhibitors. Your new favourite food and drinks are only a sample away at the Good Food & Wine Show Perth – this year set to include loads of new features and classes, the return of old show favourites, and plenty of celebrity chef appearances. Western Australia is spoilt for choice with loads of wonderful produce and fresh local flavours on our doorstep. 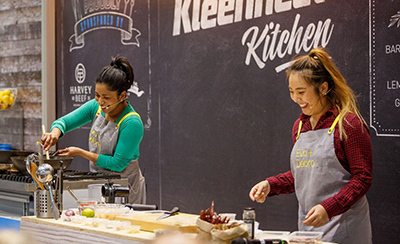 See some of our best produce shine in east-meets-west taste sensations at the Kleenheat Kitchen during the Good Food & Wine Show in Perth. Local foodies and 2015 My Kitchen Rules semi-finalists Eva & Debra will take you from their culinary heritage to the secrets of modern Asian cuisine – inspiring tasty dishes to recreate and devour. Showcasing delicious local produce from Harvey Beef, Mount Barker Chicken and Buy West Eat Best, the Kleenheat Kitchen is a free event not to be missed. Watch some of Australia’s best-known chefs and restaurateurs on stage as they cook delectable dishes live on the Good Food Theatre stage. The talents of Adam Liaw, Gary Mehigan, Manu Feildel, Matt Moran and Nicole Gow will be on display, along with tricks and tips to inspire new taste sensations in your home. Good Food Theatre is included with your ticket – just choose your favourite chef and get there early as there’s no allocated seating. Being a Kleenheat customer is all about enjoying better value. That’s why we’re excited to announce our partnership with Good Food & Wine Show Perth means Kleenheat customers can see all this year’s action for less with our special 2-for-1 ticket offer. Customers will have access to this offer through our monthly newsletters. Head to the Good Food & Wine Show website for full details on everything to see and do across three big days in Perth. Keep an eye out for more from Kleenheat in the lead-up to this year’s show! 2 for 1 ticket costs what??? Standard ticket prices are available at the Good Food & Wine Show website. Kleenheat customers have access to 2-for-1 tickets using the link provided in our monthly customer newsletter sent last week. If you’re a Kleenheat customer but don’t receive our newsletters, please email marketing@kleenheat.com.au for assistance. Yes – how much are the tickets?? What is the cost of this offer? Our 2-for-1 offer is for standard tickets only, so doesn’t include VIP passes. Kleenheat customers can access the offer using the link provided in our monthly customer newsletter sent last week. Offer is valid until 25 June 2017. How long are these special tickets available for? No Price ?????? Must be free !!!!!! You’re best to contact Citi directly for information on their products and offers. If a life or property is threatened, please call 000. © Copyright 2019 Kleenheat. All Rights Reserved.